Specialists in providing solutions to non-conventional marine problems ocean towage - salvage - rescue - harbour towage - anchorhandling - wreck removal - offshore expertise - diving - heavy and high lift operations - pontoon transportation - underwater survey - anchor-laying and buoy installation - services to coastal cable - and pipe - laying operations - moorings - cargo recovery - trans- portation and positioning of large structures or caissons - services to the fabrication of floating concrete structures - preservation of machinery against water damage - supply services - shipdelivery - marine fire fighting - naval mine clearance - marine project consultancy - harbour trips and catering. The more difficult your problem the more you need Smit. 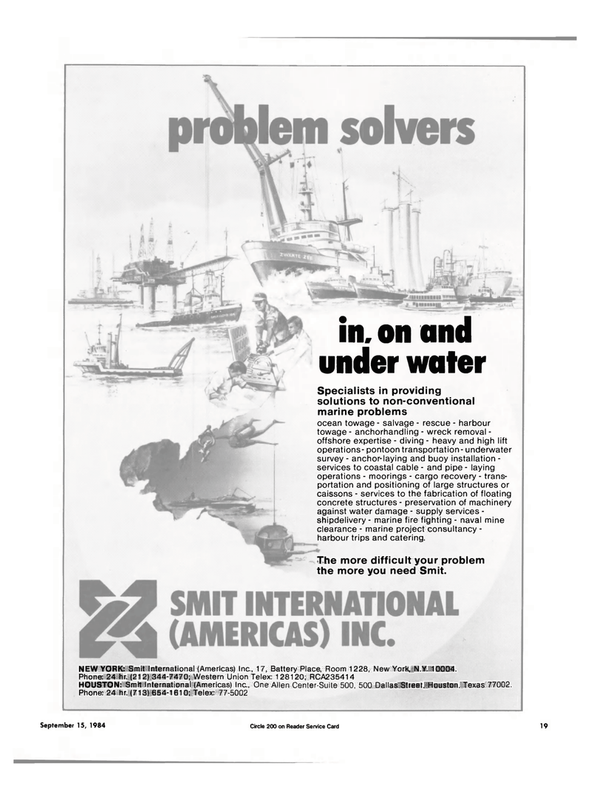 NEW YORK: Smit international (Americas) Inc., 17, Battery Place, Room 1228, New York, N.Y. 10004. HOUSTON: Smit International (Americas) Inc., One Allen Center-Suite 500, 500 Dallas Street, Houston, Texas 77002.